Total BS, no country can run any economic policy without consequences (maybe except USA, lol), obviously. Not to mention that Japan (even when it was hit by the crisis) and Singapore are fully developed economies. Currently China's PPP GDP per capita is something like 25% of the US (Russia is at 40-45%, Japan and Singapore 70%+). So people should really stop with these doom-and-gloom stories. It seems that high savings have been a good thing for East Asian economies, and again: China is really not an exception (if anything it's a positive outlier, even compared to other East Asian economies at the same stage of development), no matter how you try to spin it. And as kvs said earlier, China's GDP is nowhere near saturation, their foreign debt is miniscule, the economy is heavily under state control (in a good way). Some kind of crisis is of course inevitable, but most likely it won't happen anytime soon. Again, Japan was already fully developed when it stagnated. It's just that China's population is 10 times larger, so it's economy is already many time larger than Japan's. A simple and obvious fact that many seem to forget for some reason - including the Western MSM. The US trade policy is dictated by its foreign policy. And it is quite disastrous for the US economy. The key is the TRADE. If a country small then it can run any trade balance as it wish. If big then it works only for limited time. Anyway, China manufacturing more heavy duty truck than the US+ EU + Japan COMBINED. Same true for steel / cement and so on. Means big part of the economy is on the same level like the US or EU, and it is nothing else than ( surprise) investment + trade related industries. The CONSUMPTION is seriously underdeveloped. So, arguing against that the Chinese economy is unbalanced is like saying that the pigs can fly. Sure there is overproduction. And the problem is being dealth with atm. When it comes to consumption... it's actually booming. The service sector is already over 50% of GDP and over 70% of economic growth. China is already the largest market for many products. If a country is already the largest market for the likes of Apple, while having a modest GDP per capita, it can't have some massive problems with consumption, quite the opposite. Not to mention that according to recent reports, domestic demand's share of GDP growth is something like 95%, currently. Which makes perfect sense, considering that global trade has been stagnating and the Chinese economy is still growing by almost 7% a year. The stereotype that the Chinese economy is somehow massively dependent on exports is very outdated and it was always exaggerated. So if anything, Chinese GDP is underestimated... by something like 20% and in reality it's more developed than the official figures would indicate. So IMO it's likely we will see upwards adjustments in the near future. Which means that the consumption as a % of GDP is also higher. And in any case, you're probably using outdated numbers. Kimppis wrote: Sure there is overproduction. And the problem is being dealth with atm. so , let analyse your statement. We know that the chinese economy was driven from 1980 by the high investment (and export, but that is the smaller contributor). Based on this we can make a quite well established assumption about that the Chinese economical policy / politics/ legal system geared to deliver this growth. We know that as well centrally controlled economies ( like the CCCP between 1950-1975) are quite good to drive investment based growth. But based on the above data ho can you claim that China can show a miraculous ( and absolutely unique and one off from historical perspective) transformation from investment driven economy to consumption driven one? The investment driven growth benefited the wealthy and the politically well connected, the consumption driven benefiting the average Chinese. It is easy to change the growth model IF you can force the wealthy to give up its money, and the powerful to give up its power. Not necessarily. The rich will end up keeping their wealth by making their products more inclined to domestic consumption. They have a population of about 1.3B people. Sell an item for $1 to 300M, you made $300M in sales. If the average person makes more, the more they can spend. Its the import/export oligarchs who will get hurt. miketheterrible wrote: Not necessarily. The rich will end up keeping their wealth by making their products more inclined to domestic consumption. They have a population of about 1.3B people. Sell an item for $1 to 300M, you made $300M in sales. If the average person makes more, the more they can spend. The persons who have money in chine collected it NOT because they know that what the consumers wants OR how to organise business OR how to make things for cheap but because they know the right person or they are in the right position. And the backbone of the process is the more and more expensive workforce , that forcing the businesses to cut cost or die. This is the problem of the Russian or American economy. Too many powerful interest trashing the politician and economical processes. Don't know about that. Russia is a huge consumer and the import substitution was somewhat a success and is still in full driving force. miketheterrible wrote: Don't know about that. Russia is a huge consumer and the import substitution was somewhat a success and is still in full driving force. In the past few years they cut back the consumption in Russia, I presume to move money into investment. Should be interesting to see the end. But the stable level of employment promising. Well, when it comes to China's economic growth, South Korea seems to be a very similar case. South Korea used to be poorer than the North. South Korea began its fast economic growth roughly 2 decades earlier than China... so right now China simply tracks 2 decades behind South Korea. And again, the Chinese growth is increasingly based on consumption as I pointed out on my previous post. Kimppis wrote: Well, when it comes to China's economic growth, South Korea seems to be a very similar case. South Korea used to be poorer than the North. South Korea began its fast economic growth roughly 2 decades earlier than China... so right now China simply tracks 2 decades behind South Korea. Both of them small compared to China. Japan and Korea can use the export way more than china, simply due to the different size. The only way for China is the same that the US had to walk. China’s much-vaunted campaign to tackle its leverage problem has captured headlines this year. But to understand why they’re taking on the challenge -- and the threat it could pose to the world’s second-largest economy -- you need to dig into the mountain. 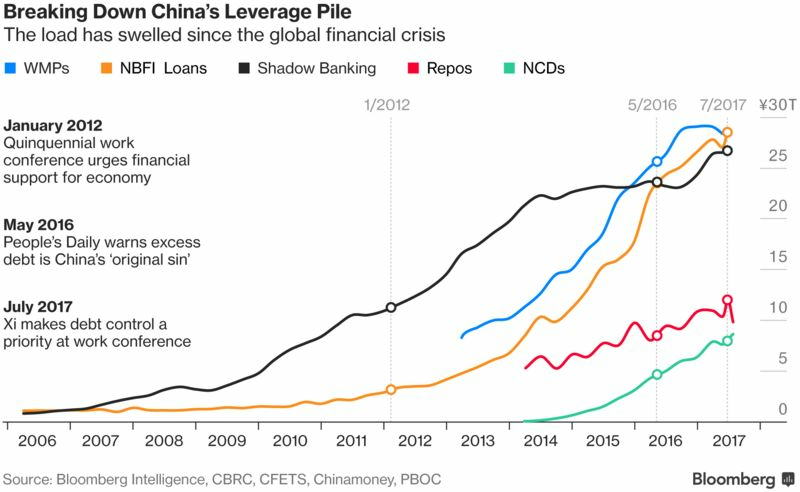 Characterized in state media as the “original sin” of China’s financial system, leverage has swelled over the past decade -- partly because policy makers were trying to cushion a slowdown in growth from the old normal of 10 percent plus. What’s fueled the leverage has been a rapid expansion in household and corporate wealth looking for higher returns in a system where bank interest rates have been held down. Implicit backing from the central government meant borrowers had free license to take on debt. “You basically have anybody selling anything they want as they think they can’t lose,” Collier said. Deleveraging -- championed by President Xi Jinping and the Communist Party Politburo in April -- hasn’t truly begun, as “they’re trying to forestall the pain as long as possible,” he said. Read more here about how the focus of deleveraging has been shifting. The equivalent of trillions of dollars are now held in all manner of assets in China, from high-yielding wealth management products to so-called entrusted investments. Taking the heftiest piece of the leverage mountain first, wealth management products had a precipitous rise over the past several years. A way for borrowers who have trouble getting traditional bank loans to win funding, WMPs have grown in popularity as they typically offer savers much higher yields than banks offer on deposits. 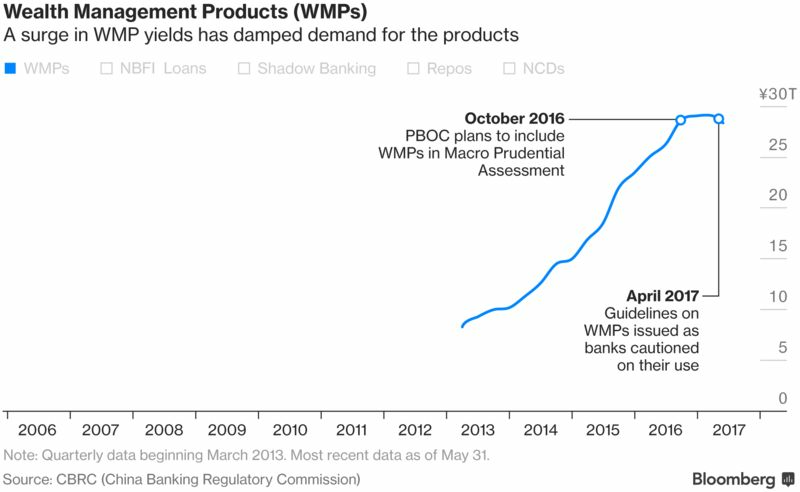 WMPs are also a hit because they give lenders a way to keep loans off of their balance sheets, and to skirt regulatory requirements when channeling funds to borrowers, according to Raymond Yeung, chief economist for Greater China at Australia & New Zealand Banking Group Ltd. in Hong Kong. The regulatory crackdown this year -- mostly in the form of more stringent guidelines on use of financial products -- has seen the amount of WMPs outstanding taper off from a peak in April, while yields on them have surged as providers competed for funds. In July, the bank watchdog is said to have told some lenders to cut the rates they offered on the products. 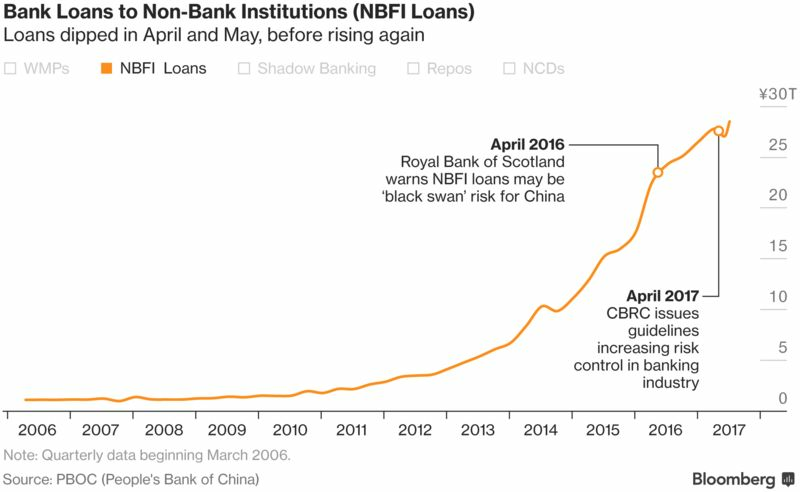 Turning to loans by banks to non-financial institutions, this is an area that’s yet to be dented much by what Xi has characterized as a de-risking drive. Yeung says the leadership’s campaign poses a “real test” for China and its regulators. 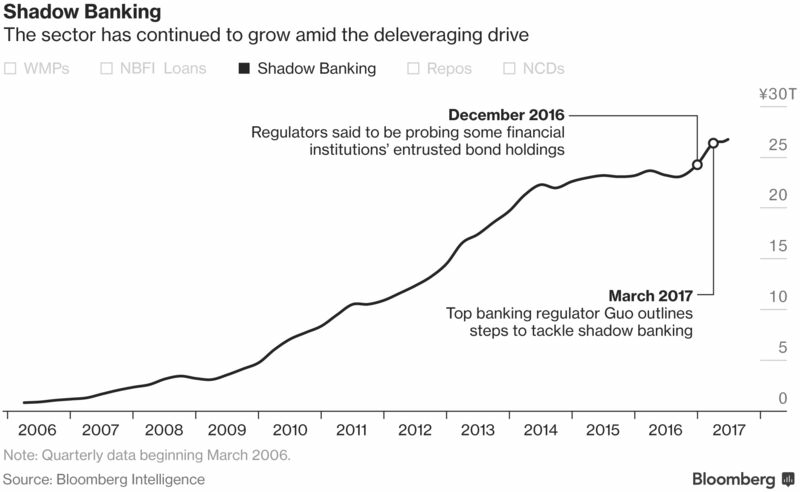 Since regulators ramped up their measures to curb financial leverage at the start of April, shadow banking has been in the cross-hairs. The most popular forms include entrusted loan agreements (when a company lends money to another company with the bank as the middleman), trust loans (where banks use money raised from WMPs to invest in trust plans, with the proceeds eventually going to a corporate borrower) and bankers’ acceptances (a bank-backed guarantee for a future payment). Data compiled by Bloomberg Intelligence tracking all three sectors show shadow banking still amounted to a record 26.7 trillion yuan as of the end of June. Shadow financing is seen as one of the culprits behind China’s property-price surge, and regulators this year banned private-equity lending to developers for land purchases. Banks also were told in March to submit reports on their entrusted investments -- funds that Chinese lenders farm out to external asset managers -- and Beijing recently extended the deadline after some struggled to determine the scope of their exposures. More directly connected to markets are repurchase agreements, where participants can get cash for set periods. A key tool for officials to rein in borrowing has been boosting funding costs in the money market. And indeed, the amount of repos outstanding has come off since reaching a peak at the end of June. 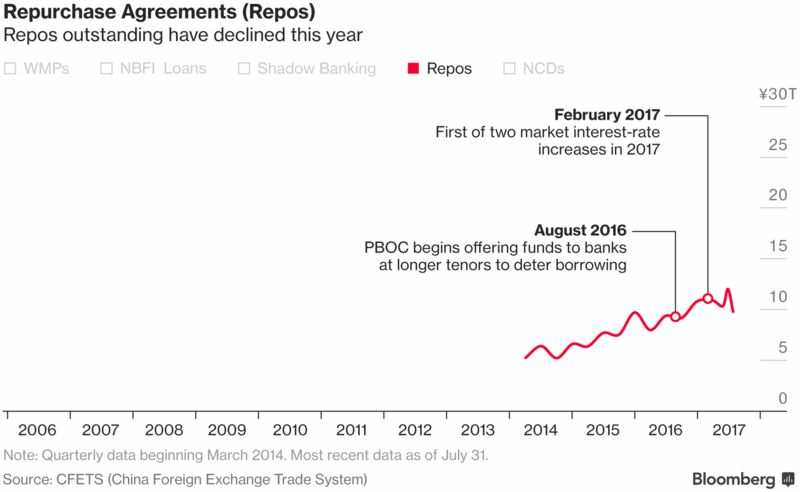 The People’s Bank of China in March hiked rates on reverse-repurchase agreements and also raised the cost of medium-term loans. HSBC Holdings Plc analysts are among those seeing some further boost to money-market rates. Negotiable certificates of deposit are relative minnows in China’s ocean of leverage, but they are a lifeline for smaller banks that have difficulty competing for savings against the big state lenders. NCDs morphed into a way for small banks to fund purchases of each other’s WMPs, with a circular arrangement developing whereby the banks selling the products would then channel the proceeds into the bond market, resulting in a mismatch between the shorter-term NCDs and other debt investments. After dipping slightly in May as the deleveraging rhetoric intensified, the amount of NCDs outstanding has started rising again, reaching a record last month. 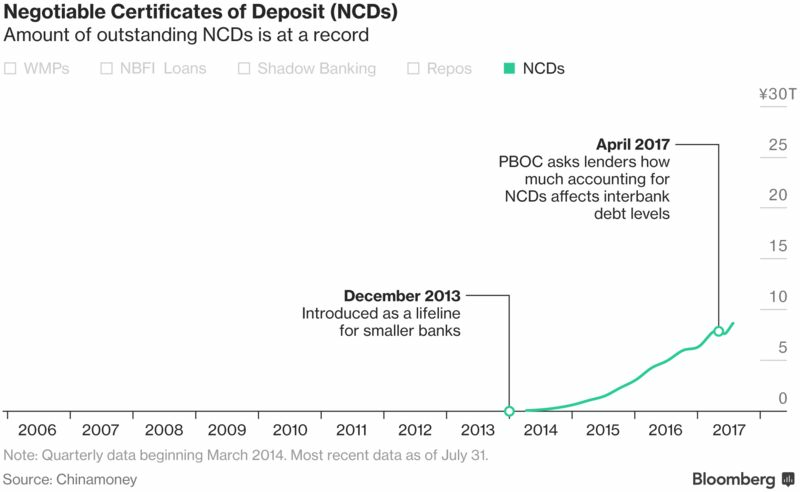 Earlier in the year, the PBOC was said to be mulling requiring lenders to re-classify NCDs as interbank liabilities, a move that would likely quell their growth because of limits on how much interbank debt banks are allowed to hold relative to their overall liabilities. China’s monetary authorities for years focused on incubating innovation in the financial system, after decades when Soviet-style command and control was the model. Having successfully overseen an explosion in new types of credit, they are having to pivot into the role of gatekeepers and supervisors -- and to coordinate themselves better as risks pile up, according to Yeung and his colleagues at ANZ.